This fine collection of cheeses featuring Farmhouse Reserve, White Oak, Alpine and New York Vintage is bursting with flavor! Enjoy these delicious cheddars in your favorite comfort food, like this Alpine Mac & Cheese, or add it to a yummy cheese board along with all your favorite accompaniments. Alpine Cheddar takes this fresh and flavorful salad to the next level! Try this cheesy Creamed Spinach featuring Farmhouse Reserve Cheddar. Enjoy delicious recipes featuring the Legacy Collection! 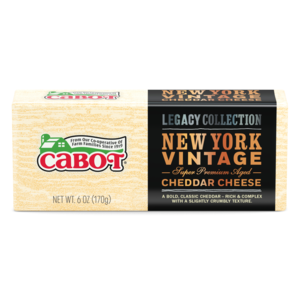 Your family and friends will love the dishes you serve up using this fine collection of cheeses, featuring White Oak, Alpine, New York Vintage & Farmhouse Reserve Cheddar. The Farm Families who own Cabot know the importance of pairing wine and cheese. Enjoy these wine pairing recommendations using this fine collection of cheeses now! Pair the Legacy Collection of Cheeses with your favorite wine! Check out our Beer and Cheddar Pairings using the Legacy Collection! Beer & Cheddar...What could be better! The Farm Families who own Cabot know the importance of pairing a good beer with your favorite Cheddar which is why we've provided our best reccommendations and tips for you to enjoy!